The Lunar New Year is only weeks away. Are you ready with the preparation to welcome the festivities? Kuali.com is here to provide countless kitchen inspirations for the celebration, starting with this recipe on Almond Crunch. The Cantonese pronunciation for almond is hang yan. Hang is part of weng hang meaning perpetual. Yan sounds like ngan, which means money or silver. So the significance of giving almonds during Lunar New Year is symbolic of wishing the recipient perpetual fortune and prosperity. Using an oven toaster, place almond flakes in a small oven-safe dish and toast at 150°C for 2 to 3 minutes until fragrant and slightly brown. Remove and mix through at intervals to ensure even toasting. Alternatively, toast almond flakes in a pan on your stove over low flame. Line a shallow oven dish (28 x 20 cm) with aluminium foil and smooth out any creases. Grease with butter. In a non-stick pan, mix butter, sugar and water and melt over medium-high heat while stirring continuously. Reduce to medium heat and cook for 6 more minutes, stirring constantly to ensure mixture is frothy and gently bubbling. Remove from heat and pour mixture into lined dish. Tilt dish quickly to cover the base evenly or use the back of a spoon dipped in water to level out the mixture. Melt chocolate in a microwave oven on medium heat for 2 minutes. Stir to ensure chocolate is evenly melted. Scoop chocolate onto the butter/sugar layer and spread to completely cover the base. 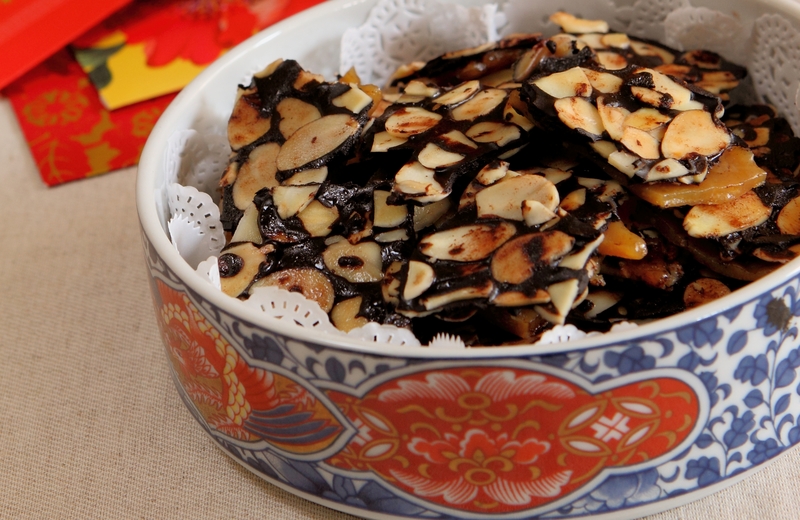 Sprinkle almond flakes evenly onto the chocolate. Press flakes into the chocolate so that they stick. Leave to cool before chilling in the fridge for at least 1 hour. Remove, gently lift the foil and break almond crunch into bite-size pieces. Store in an airtight container and keep in the fridge for up to a month. Note: Using an oven dish smaller than the one specified in the recipe yields less crunch but results in a thicker sugar layer. Also, it’s best to use pure butter for this recipe.